"As Symetrix continues to grow globally, one of the next steps in this expansion was the addition of a dedicated sales and technical resource for Latin America", says Mark Ullrich, international sales manager at Symetrix. "PRO AVLS was the natural choice for us in the region. Alex Rojas, president, has served as a Symetrix dealer with Caribbean Broadcast Suppliers, thus he and his team are already familiar with our product line. Both Alex and his colleague Guillermo Sánchez, based in Venezuela, also had tenure at Harman, so they are well versed in the sale and support of DSP solutions." For PRO AVLS, already an established representative working with brands including DiGiCo and Martin Audio, this agreement allows customers access to a very unique product range across Latin America. "There's a strong need for versatile DSP platforms in the region", comments Guillermo Sánchez, sales director at PRO AVLS. "Although there are many players in the market, we wanted to partner with a manufacturer which would give our customers an edge against competitors in terms of usability, compatibility, audio quality, reliability, and price." "Low-cost, turnkey products like Jupiter, an app-based DSP, are perfect for everyday installations, whilst the increased flexibility afforded by the SymNet line, including Edge and Radius AEC, can offer a scalable Dante-enabled solution for larger, more complex projects. Symetrix can stand proud as it provides a product to solve every possible challenge and fit within every possible application," enthuses Sánchez. PRO AVLS president, Alex Rojas, also shares excitement about the new partnership. "As we work together to bring market-leading DSP solutions to our customers, prospects and friends, they will see the benefits of Symetrix products and the benefit PRO AVLS brings to their toolset. We are very proud of representing a brand with such great heritage and respect in the audio industry," he confirms. With this new appointment, Symetrix expects more focus on and support of its existing distribution arrangements in the region. "We’re also looking forward to incrementally adding new strategic partnerships to ensure Symetrix has the most competitive positioning possible in Latin America", says Ullrich. "Latin America is a vast and dynamic territory, so taking this next step with a dedicated sales and support resource will help Symetrix fulfil the opportunities that exist", he concludes. 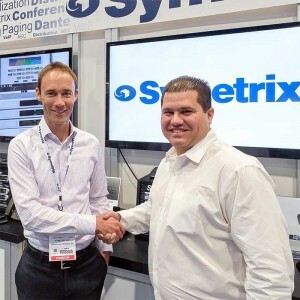 In picture: Mark Ullrich), international sales manager at Symetrix, and Alex Rojas, managing director of PRO AVLS, reaffirming their partnership at this year's InfoComm show in Las Vegas.